A local Herndon EMS technician was named the First Responder of the Quarter by the Greater Reston Chamber of Commerce at a luncheon today. Acting EMS technician David Bulman, who is currently stationed at station 404 in Herndon, was selected for the honor. 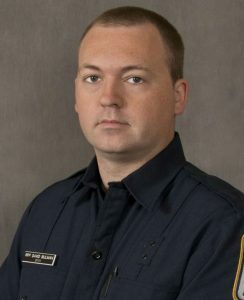 Bulman was promoted from an entry fire medic to his current position despite only working for the Fairfax County Fire and Rescue Department for three years. His experience was tested on June 24 when his unit was dispatched to respond to a a report of a drowning. During the incident, two children were in cardiac arrest at a pool. Bulman and his unit reacted quickly as the lead provider in the double cardiac arrest case. Bulman showed “amazing tact” in managing the team and creating a stable scene until additional resources arrived, said Fairfax County Fire and Rescue Battalion Chief Kit Hessel. “Dave pushed himself to the highest professional medic level which helped maintain a very stable emergency scene… Dave’s love of the job shows every shift helping maintain readiness, preparing drills, and pride in making a difference on emergency incidents.” Hessel said. The honor is given during an appreciation luncheon by the GRCC for local EMT, fire and rescue and police departments. The annual tradition, which began a decade ago, includes donations from more than 40 restaurants and businesses. “As a growing district in our county, we are never really cognizant of what these first responders do every day, so the business community wanted to thank them for what they do and recognize these men and women who put their lives on the line every day to ensure we are safe.” said Mark Ingrao, president and CEO of the GRCC.